When fitting and handling batteries, please make sure you and your colleagues are aware of the safety and handling by following all the safety recommendations and advice below. Batteries contain sulphuric acid and produce explosive mixtures of hydrogen and oxygen. Because self-discharge action generates hydrogen gas even when the battery is not in operation, make sure batteries are stored and worked on in a well-ventilated area. 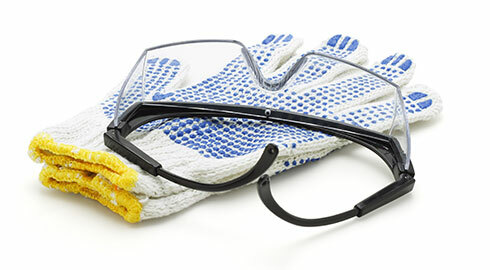 Always wear ANSI Z87.1 (U.S.) or CE EN166 (Europe) approved safety glasses and face shield or splash-proof goggles when working on or near batteries. Keep all sparks, flames and cigarettes away from the battery. Keep removable vents tight and level except when servicing electrolyte. Make sure work area is well-ventilated. Never lean over battery while boosting, testing or charging. Exercise caution when working with metallic tools or conductors to prevent short circuits and sparks. Turn the charger and timer “OFF” before connecting the leads to the battery to avoid dangerous sparks. Always turn the charger “OFF” before removing charger leads from the battery to avoid dangerous sparks. If the electrolyte is splashed into an eye, immediately force the eye open and flood it with clean, cool water for at least 15 minutes. Get prompt medical attention. If electrolyte is taken internally, drink large quantities of water or milk. DO NOT induce vomiting. Get prompt medical attention. Neutralize with baking soda any electrolyte that spills on a vehicle or in the work area. After neutralizing, rinse contaminated area clean with water. To prepare electrolyte of a specific gravity, always pour the concentrated acid slowly into the water; DO NOT pour water into the acid. Always stir the water while adding small amounts of acid. If noticeable heat develops, allow the solution to cool before continuing to add acid.